Piece by piece, tiny tile by tiny tile, the monastery at Daphni is being restored. It’s taken years and it’s bound to take years more – perhaps even longer than it took to build in the first place. Such is the art of making something old look old again. And it’s not the first time it’s had to be done. About ten kilometres from the centre of Athens, this Byzantine-style monastery was first built in its current form almost a thousand years ago. It had risen from the ruins of an ancient temple dedicated to Apollo Daphneios. Over the millennium between then and now, both men and nature have taken turns trying to destroy it. In the 1200s, Frankish crusaders sacked it – but a religious order faithful to the then Duke of Athens began to restore it two years later. In 1821 it was deconsecrated and used as a barracks and then an asylum but about 60 years later, in 1888, another round of restoration began. Then, in 1889 and again in 1897, there were earthquakes which required the Greek Archaeological Society to come in and help with some of the damage. You’d think that would’ve been more than enough for one monastery to handle – but just when things were looking good, another earthquake struck in 1999. The building was badly damaged and recovery work has been going on ever since. It is possible to visit the Daphni monastery these days, though. The only things to be aware of are the limited opening hours and limited accessibility. It’s a bit like walking into a construction site, enclosed within a hurricane fence and with safety warning signs hanging everywhere. Inside the monastery itself you can see the painstaking work that’s taking place to restore the mosaics on the walls. This is the most time-consuming part of the restoration – but also the most important. These beautiful designs are one of the main reasons this site is so special. Unfortunately photography isn’t allowed inside but the restoration work has one advantage: the interior is filled with a huge scaffolding structure which you can climb up to get a close view at the mosaics on the higher levels that would normally be out of sight. The whole church is designed as if it is the universe. In the dome at the top, representing heaven, are mosaics of Christ and his prophets. Slightly further down are scenes from the life of Jesus and towards the lower part of the walls are images of saints and martyrs. Every single image was delicately made hundreds of years ago of minute little pieces… thousands and thousands of them. To restore them faithfully takes time and care to make sure everything looks as authentic as possible. 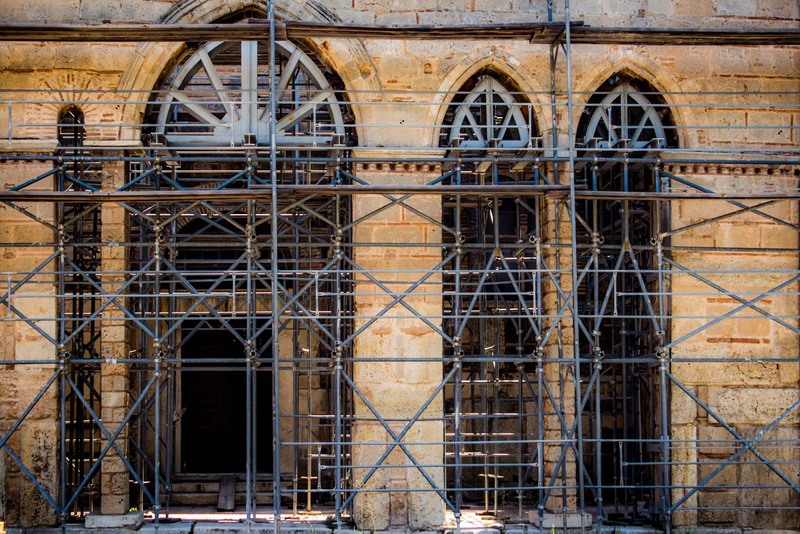 Who knows when the monastery at Daphni will be completely restored and reopened to the public? At this rate, it could take many more years. Although this is the most convenient to visit, there are two other churches in Greece which show the same kind of marble art and Byzantine mosaic art which have also been included on the UNESCO World Heritage list. They are the monastery of Hossios Luckas, about 40 kilometres from Delphi, and the monastery of Nea Moni on the island of Chios. If this is your kind of thing, they could be worth the excursions. What a puzzle – I’m not sure I’d have the patience. I wonder what the turnover of staff is like. Once you had started, would you want to finish or would you lose patience and quit? I’m always fascinated with architecture and this structure would definitely be worth restoring to its original state. Very interesting story. So much time and effort going into the restoration & then another earthquake hits. Hope I get to see Daphni completed someday. I know – how annoyed would you be if you were just about the finish restoration and an earthquake hit. It would be like knocking over the dominoes when you’ve only got a couple left to place! Interesting history behind the monastery. I’m glad that the Greeks decided that is it worth saving. I think when something has been around that long, there’s not much choice but to save it! Amazing the work that they are putting into it’s restoration! Great story. Nice photographs Michael. Its wonderful to see a world that was.They are doing a wonderful job. Yes, it’s great to see the effort going into restoring the site, isn’t it? It’s important we conserve our history!